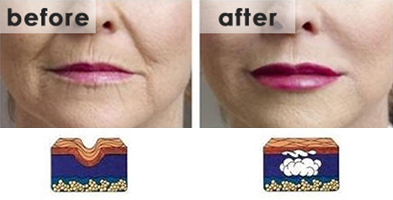 Lips change with age: they become thinner with deflation, and develop radial wrinkles (“barcode lines”) due to the repetitive wrinkling action of sub-cutaneous muscle and deflation. The age-related lip changes can be helped with use of Botox and soft tissue fillers. The muscles that cause repetitive wrinkling of the skin just above and below the lips can be relaxed with a tiny dose of Botox without affecting your ability to use your lips. The volume lost due to aging can be replaced with fillers, restoring the shape of a young lip. Results may vary from person to person. Whether you wish to change your lips caused by aging process, or you simply want to augment your lips to improve your overall appearance and appeal, we can easily help you with our lip enhancement procedure.